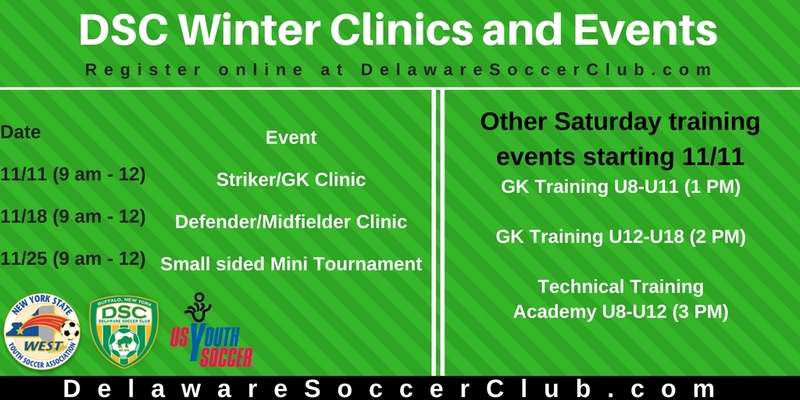 Register now for all the upcoming Saturday programs offered by Delaware Soccer Club! All take place indoors at the Nardin Academy Athletic Facility and offer players a fun opportunity to improve their soccer skills. Players U8-U18. Cost for each of the above is just $20 each, or $50 for all three! Session I - runs six weeks, every Saturday: Nov. 11 - Dec. 16. Cost is $60. All goalies U8-U11 at 1:00 PM. All goalies U12-U18 at 2:00 PM.